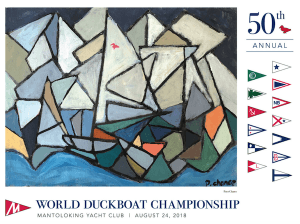 The World Duckboat Championship, conceived by the junior sailors of the Mantoloking Yacht Club in 1969 and continually hosted for 50 years since, is one of the iconic annual events on Barnegat Bay. It is a happening, a celebration of the heritage of Barnegat Bay and wooden boat building. It is one of the few Championship regattas where junior sailors can race and compete directly with some of the best senior sailors on the Bay. Many who have moved on from our waters return each year just for this event.